The emotion we experience when we hear the word ‘surgery’ is panic. The word ‘surgery’ creates a frightening word web including the words risk, pain, scar, recovery, hospital, scissors & knives, bed rest and what not! But not all surgeries are equal. A joint replacement surgery can definitely be considered a big deal. True, joint replacement surgeries used to cause some concern to surgeons in the past, but with advanced medical technologies, a lot of the concerns have been diminished to almost none. 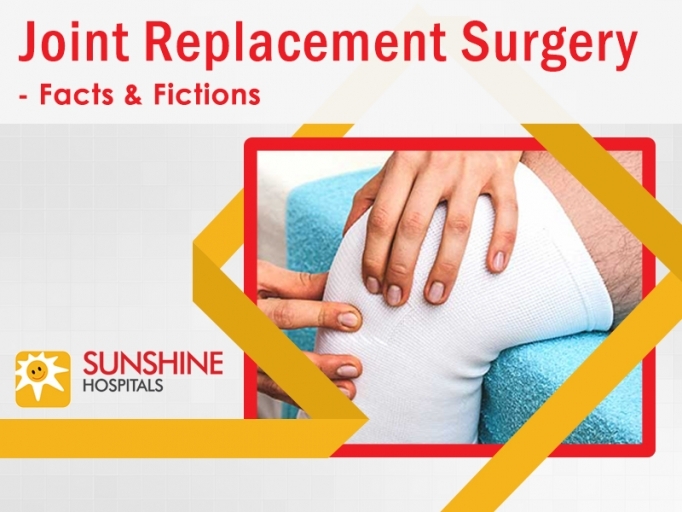 Let’s read about some interesting facts about joint replacement surgery and find out which issues regarding joint replacement surgery are valid no more. Joint Replacement Myth: The surgery is extremely painful. Joint Replacement Fact: All surgeries are painful. But, the good news is that most of it can be managed with anaesthesia. Generally, the surgeons will sedate you so that you sleep through the entire procedure. The postoperative phase can be a little painful, which can be managed with mild painkillers. Joint Replacement Myth: It takes a long stay at the hospital. Joint Replacement Fact: Wrong. Yes, the big surgeries will require you to stay a few days at the hospital, but even the biggest ones won’t require a stay of more than one week. Joint Replacement Myth: It takes months to recover from a joint replacement surgery. Joint Replacement Fact: The key to a successful recovery from a joint replacement surgery is taking it slow. The recovery period is a balanced combination of rest and physiotherapy. You will be able to go back to your regular life within a couple of weeks. But it’s still advisable to not put heavy pressure on the operated area for six months. Joint Replacement Myth: The artificial replacements are not good and they always feel uneasy. Joint Replacement Fact: Replacements can be synthetic or grafted from you own tissue. Different patients react differently to the replacements. Only a doctor will be able to tell you which will suit you the best. But there is no difference in the efficiency of any kind of replacement once the body is ready to accept it. Once you have recovered from the surgery, the replaced joint should feel as good as your original one. Joint Replacement Myth: Replaced joint only lasts for 10 years. Joint Replacement Fact: Replaced joints lasts at least for 25 years, if not a lifetime. Wearing off of artificial joints was a concern before but medical tools and technologies are much more advanced now. Joint Replacement Myth: Children can’t get joint replacement surgery. Joint Replacement Fact: When it comes to this particular surgery, age is not an issue. In fact, if you require a surgery, you should get it done as soon as possible before it causes further damage. Joint Replacement Myth: You will get a huge scar after the surgery. Joint Replacement Fact: This myth has a history. Earlier, joints were replaced in a open surgery which was highly invasive. In those days, surgeries used to leave scars. But with minimally invasive surgery, scarring will be minimal which will probably fade over time. Now you know that joint replacement surgery is not as scary anymore. Be brave, find a good clinic and go for it! A multi-super speciality institution, 500+ bedded Sunshine Hospitals (Paradise Circle, Secunderabad) is promoted by globally reputed Joint Replacement Surgeon Dr. AV Gurava Reddy and like-minded associates who share the objective of making world-standard healthcare available, affordable and accessible to the common man.